I honestly thought I was “circused-out” after doing a full month of circus-inspired photos for Cirque de Seraphim in November. So when The Challenge introduced its theme of “Fairground/Circus” for this month, I admit I sighed. Not being a role-player or heavily into themed decor, I was a bit reticent about blogging even more Big Top stuff. But then, I took a look at what the designers have come up with, and I was quietly delighted. I fell in love with the organ from 22769 ~ [bauwerk] with it’s muted hues and loving detail. When you play one of the included three songs, the crank on the left side even turns! 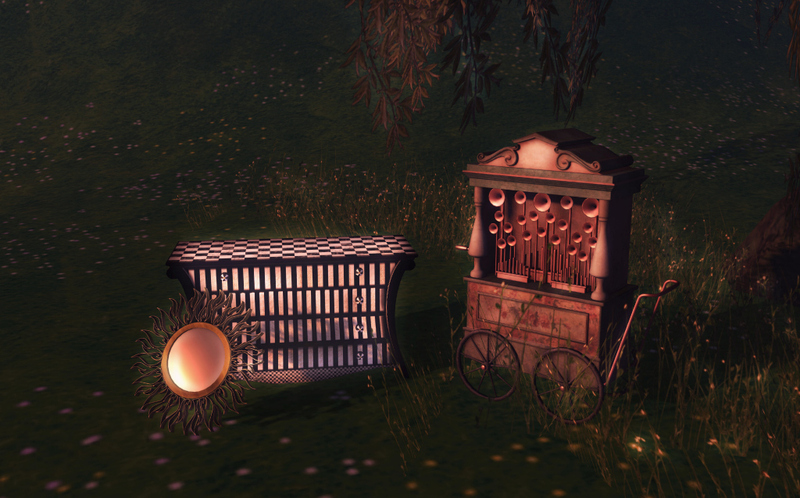 I also adore the circus dresser and mirror from *Essay*, a new-to-me store. There are three poses included in the dresser and this will fit into even a non-circus setting.